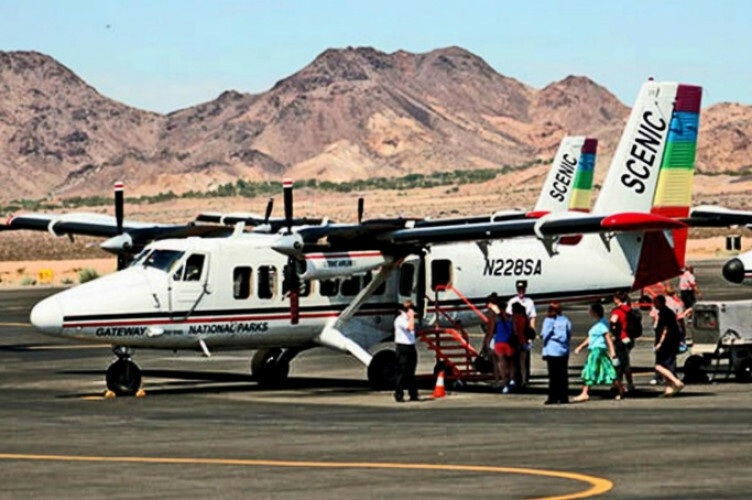 The Grand Canyon West Rim Flight And Hoover Dam Tour Takes Guests On A 70-Minute Airplane Tour From Las Vegas And Shows Them The Unique Beauty And Contours Of The Western End Of Grand Canyon. Aboard Our Vistaliner Aircraft, Specially Equipped With Oversize Windows, You Will See Amazing Aerial Views Of Lake Mead, Hoover Dam, The Colorado River And The Grand Canyon. Enjoy A Picnic Style Lunch, And Ample Time For Souvenir Shopping At The Scenic Airlines Terminal. Proceed To Hoover Dam For Your VIP Government Guided Interior Tour Of The Dam. Enjoy The Inner Working Of The Hoover Dam, History Of Its Creation, And Enjoy Ample Time For Photos. Fly Over Hoover Dam, Lake Mead, The Colorado River, And Grand Canyon. Grand Canyon West and the Grand Canyon Skywalk are the closest, most accessible portion of the Grand Canyon from Las Vegas, Nevada. The Glass Skywalk, which is sometimes called the glass skybridge, glass walkway, glass balcony, and glass floor, has become the main attraction at Grand Canyon West. Due to it’s proximity to Las Vegas and the Skywalk, Grand Canyon West has become the 2nd most visited location at the Grand Canyon. Experiencing over 1 million visitors annually now. Grand Canyon West is located on the Hualapai Indian Tribal Lands and is NOT a part of Grand Canyon National Park. However, this is the Grand Canyon regardless of whose lands it is administered or protected by. The Skywalk at Grand Canyon West has become a highly sought after experience at the Grand Canyon. While walking on the Skywalk, which juts 70 feet out over the Grand Canyon, you can look down and see ……nothing – nothing but air between you and the bottom of the Grand Canyon. Until recently, a sensation like this could only be experienced in dreams. Hoover Dam is as tall as a 60-story building. It was the highest dam in the world when it was completed in 1935. Its base is as thick as two football fields are long. Each spillway, designed to let floodwaters pass without harming the dam itself, can handle the volume of water that flows over Niagara Falls. The amount of concrete used in building it was enough to pave a road stretching from San Francisco to New York City.